For other uses, see Odessa (disambiguation). Odessa (also known as Odesa; Ukrainian: Оде́са [ɔˈdɛsɐ]; Russian: Оде́сса [ɐˈdʲesə]; Yiddish: אַדעס‎) is the third most populous city of Ukraine and a major tourism center, seaport and transport hub located on the northwestern shore of the Black Sea. It is also the administrative center of the Odessa Oblast and a multiethnic cultural center. Odessa is sometimes called the "pearl of the Black Sea", the "South Capital" (under the Russian Empire and Soviet Union), and "Southern Palmyra". Before the Tsarist establishment of Odessa, an ancient Greek settlement existed at its location as elsewhere along the northwestern Black Sea coast. A more recent Tatar settlement was also founded at the location by Hacı I Giray, the Khan of Crimea in 1440 that was named after him as "Hacıbey". After a period of Lithuanian Grand Duchy control, Hacibey and surroundings became part of the domain of the Ottomans in 1529 and remained there until the empire's defeat in the Russo-Turkish War of 1792. 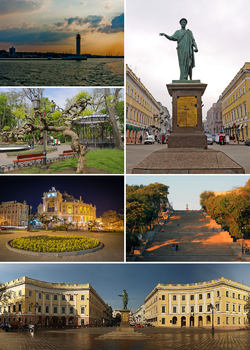 In 1794, the city of Odessa was founded by a decree of the Russian empress Catherine the Great. From 1819 to 1858, Odessa was a free port. During the Soviet period it was the most important port of trade in the Soviet Union and a Soviet naval base. On 1 January 2000, the Quarantine Pier at Odessa Commercial Sea Port was declared a free port and free economic zone for a period of 25 years. During the 19th century, Odessa was the fourth largest city of Imperial Russia, after Moscow, Saint Petersburg and Warsaw. Its historical architecture has a style more Mediterranean than Russian, having been heavily influenced by French and Italian styles. Some buildings are built in a mixture of different styles, including Art Nouveau, Renaissance and Classicist. Odessa is a warm-water port. The city of Odessa hosts both the Port of Odessa and Port Yuzhne, a significant oil terminal situated in the city's suburbs. Another notable port, Chornomorsk, is located in the same oblast, to the south-west of Odessa. Together they represent a major transport hub integrating with railways. Odessa's oil and chemical processing facilities are connected to Russian and European networks by strategic pipelines. The city was named in compliance with the Greek Plan of Catherine the Great. It was named after the ancient Greek city of Odessos, which was mistakenly believed to have been located here. Odessa is located in between the ancient Greek cities of Tyras and Olbia, different from the ancient Odessos's location further west along the coast, which is at present day Varna, Bulgaria. Catherine's secretary of state Adrian Gribovsky [ru] claimed in his memoirs that the name was his suggestion. Some expressed doubts about this claim, while others noted the reputation of Gribovsky as an honest and modest man. Odessa was the site of a large Greek settlement no later than the middle of the 6th century BC (a necropolis from the 5th–3rd centuries BC has long been known in this area). Some scholars believe it to have been a trade settlement established by the Greek city of Histria. Whether the Bay of Odessa is the ancient "Port of the Histrians" cannot yet be considered a settled question based on the available evidence. Archaeological artifacts confirm extensive links between the Odessa area and the eastern Mediterranean. In the Middle Ages successive rulers of the Odessa region included various nomadic tribes (Petchenegs, Cumans), the Golden Horde, the Crimean Khanate, the Grand Duchy of Lithuania, and the Ottoman Empire. Yedisan Crimean Tatars traded there in the 14th century. During the reign of Khan Hacı I Giray of Crimea (1441–1466), the Khanate was endangered by the Golden Horde and the Ottoman Turks and, in search of allies, the khan agreed to cede the area to Lithuania. The site of present-day Odessa was then a fortress known as Khadjibey (named for Hacı I Giray, and also spelled Kocibey in English, Hacıbey or Hocabey in Turkish, and Hacıbey in Crimean Tatar). It was part of the Dykra region. However, most of the rest of the area remained largely uninhabited in this period. Khadjibey came under direct control of the Ottoman Empire after 1529 as part of a region known as Yedisan, and was administered in the Ottoman Silistra (Özi) Province. In the mid-18th century, the Ottomans rebuilt the fortress at Khadjibey (also was known Hocabey), which was named Yeni Dünya (literally "New World"). Hocabey was a sanjak centre of Silistre Province. The sleepy fishing village that Odessa had been saw a step-change in its fortunes when the wealthy magnate and future Voivode of Kiev (1791), Antoni Protazy Potocki, set up trade routes through the port for the Polish Black Sea Trading Company and set up the infrastructure in the 1780s. During the Russian-Turkish War of 1787–1792, on 25 September 1789, a detachment of the Russian forces including Zaporozhian Cossacks under Alexander Suvorov and Ivan Gudovich took Khadjibey and Yeni Dünya for the Russian Empire. One part of the troops came under command of a Spaniard in Russian service, Major General José de Ribas (known in Russia as Osip Mikhailovich Deribas), and the main street in Odessa today, Deribasivska Street, is named after him. Russia formally gained possession of the area as a result of the Treaty of Jassy (Iaşi) in 1792 and it became a part of Novorossiya ("New Russia"). The city of Odessa, founded by Catherine the Great, Russian Empress, centers on the site of the Turkish fortress Khadzhibei, which was occupied by Russian Army in 1789. Flemish engineer working for the empress, Franz de Volan (François Sainte de Wollant) recommended the area of Khadzhibei fortress as the site for the region's basic port: it had an ice-free harbor, breakwaters could be cheaply constructed and would render the harbor safe and it would have the capacity to accommodate large fleets. The Governor General of Novorossiya, Platon Zubov (one of Catherine's favorites) supported this proposal, and in 1794 Catherine approved the founding of the new port-city and invested the first money in constructing the city. However, adjacent to the new official locality, a Moldavian colony already existed, which by the end of the 18th century was an independent settlement known under the name of Moldavanka. Some local historians consider that the settlement predates Odessa by about thirty years and assert that the locality was founded by Moldavians who came to build the fortress of Yeni Dunia for the Ottomans and eventually settled in the area in the late 1760s, right next to the settlement of Khadjibey (since 1795 Odessa proper), on what later became the Primorsky Boulevard. Another version posits that the settlement appeared after Odessa itself was founded, as a settlement of Moldavians, Greeks and Albanians fleeing the Ottoman yoke. In their settlement, also known as Novaya Slobodka, the Moldavians owned relatively small plots on which they built village-style houses and cultivated vineyards and gardens. What became Mykhailovsky Square was the center of this settlement and the site of its first Orthodox church, the Church of the Dormition, built in 1821 close to the seashore, as well as of a cemetery. Nearby stood the military barracks and the country houses (dacha) of the city's wealthy residents, including that of the Duc de Richelieu, appointed by Tzar Alexander I as Governor of Odessa in 1803. In the mid-19th century Odessa became a resort town famed for its popularity among the Russian upper classes. This popularity prompted a new age of investment in the building of hotels and leisure projects. In the period from 1795 to 1814 the population of Odessa increased 15 times over and reached almost 20 thousand people. The first city plan was designed by the engineer F. Devollan in the late 18th century. Colonists of various ethnicities settled mainly in the area of the former colony, outside of the official boundaries, and as a consequence, in the first third of the 19th century, Moldavanka emerged as the dominant settlement. After planning by the official architects who designed buildings in Odessa's central district, such as the Italians Francesco Carlo Boffo and Giovanni Torricelli, Moldovanka was included in the general city plan, though the original grid-like plan of Moldovankan streets, lanes and squares remained unchanged. The new city quickly became a major success although initially it received little state funding and privileges. Its early growth owed much to the work of the Duc de Richelieu, who served as the city's governor between 1803 and 1814. Having fled the French Revolution, he had served in Catherine's army against the Turks. He is credited with designing the city and organizing its amenities and infrastructure, and is considered[by whom?] one of the founding fathers of Odessa, together with another Frenchman, Count Andrault de Langeron, who succeeded him in office. Richelieu is commemorated by a bronze statue, unveiled in 1828 to a design by Ivan Martos. His contributions to the city are mentioned by Mark Twain in his travelogue Innocents Abroad: "I mention this statue and this stairway because they have their story. Richelieu founded Odessa – watched over it with paternal care – labored with a fertile brain and a wise understanding for its best interests – spent his fortune freely to the same end – endowed it with a sound prosperity, and one which will yet make it one of the great cities of the Old World". By the early 1900s Odessa had become a large, thriving city, complete with European architecture and electrified urban transport. In 1819, the city became a free port, a status it retained until 1859. It became home to an extremely diverse population of Albanians, Armenians, Azeris, Bulgarians, Crimean Tatars, Frenchmen, Germans (including Mennonites), Greeks, Italians, Jews, Poles, Romanians, Russians, Turks, Ukrainians, and traders representing many other nationalities (hence numerous "ethnic" names on the city's map, for example Frantsuzky (French) and Italiansky (Italian) Boulevards, Grecheskaya (Greek), Yevreyskaya (Jewish), Arnautskaya (Albanian) Streets). Its cosmopolitan nature was documented by the great Russian poet Alexander Pushkin, who lived in internal exile in Odessa between 1823 and 1824. In his letters he wrote that Odessa was a city where "the air is filled with all Europe, French is spoken and there are European papers and magazines to read". Odessa's growth was interrupted by the Crimean War of 1853–1856, during which it was bombarded by British and Imperial French naval forces. It soon recovered and the growth in trade made Odessa Russia's largest grain-exporting port. In 1866, the city was linked by rail with Kiev and Kharkiv as well as with Iaşi in Romania. The city became the home of a large Jewish community during the 19th century, and by 1897 Jews were estimated to comprise some 37% of the population. The community, however, was repeatedly subjected to anti-Semitism and anti-Jewish agitation from almost all Christian segments of the population. Pogroms were carried out in 1821, 1859, 1871, 1881 and 1905. Many Odessan Jews fled abroad after 1882, particularly to the Ottoman region that became Palestine, and the city became an important base of support for Zionism. In 1905, Odessa was the site of a workers' uprising supported by the crew of the Russian battleship Potemkin and Lenin's Iskra. Sergei Eisenstein's famous motion picture The Battleship Potemkin commemorated the uprising and included a scene where hundreds of Odessan citizens were murdered on the great stone staircase (now popularly known as the "Potemkin Steps"), in one of the most famous scenes in motion picture history. At the top of the steps, which lead down to the port, stands a statue of the Duc de Richelieu. The actual massacre took place in streets nearby, not on the steps themselves, but the film caused many to visit Odessa to see the site of the "slaughter". The "Odessa Steps" continue to be a tourist attraction in Odessa. The film was made at Odessa's Cinema Factory, one of the oldest cinema studios in the former Soviet Union. Following the Bolshevik Revolution in 1917 during Ukrainian-Soviet War, Odessa saw two Bolshevik armed insurgencies, the second of which succeeded in establishing their control over the city; for the following months the city became a center of the Odessa Soviet Republic. 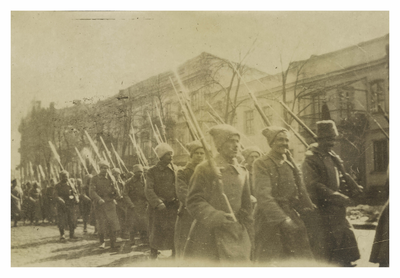 After signing of the Brest-Litovsk Treaty all Bolshevik forces were driven out by 13 March 1918 by the combined armed forces of the Austro-Hungarian Army, providing support to the Ukrainian People's Republic. With the end of the World War I and withdrawal of armies of Central Powers, the Soviet forces fought for control over the country with the army of the Ukrainian People's Republic. A few months later the city was occupied by the French Army and the Greek Army that supported the Russian White Army in its struggle with the Bolsheviks. The Ukrainian general Nikifor Grigoriev who sided with Bolsheviks managed to drive the unwelcome Triple Entente forces out of the city, but Odessa was soon retaken by the Russian White Army. Finally, by 1920 the Soviet Red Army managed to overpower both Ukrainian and Russian White Army and secure the city. The people of Odessa suffered badly from a famine that resulted from the Russian Civil War in 1921–1922 due to the Soviet policies of prodrazverstka. Odessa was attacked by Romanian and German troops in August 1941. The defense of Odessa lasted 73 days from 5 August to 16 October 1941. The defense was organized on three lines with emplacements consisting of trenches, anti-tank ditches and pillboxes. The first line was 80 kilometres (50 miles) long and situated some 25 to 30 kilometres (16 to 19 miles) from the city. The second and main line of defense was situated 6 to 8 kilometres (3.7 to 5.0 miles) from the city and was about 30 kilometres (19 miles) long. The third and last line of defense was organized inside the city itself. A medal, "For the Defence of Odessa", was established on 22 December 1942. 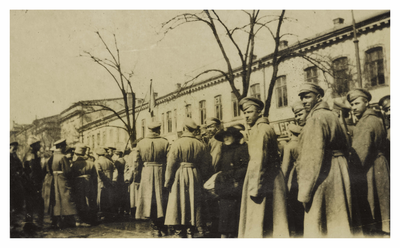 Approximately 38,000 people were awarded to servicemen of the Soviet Army, Navy, Ministry of Internal Affairs, and civil citizens who took part in the city's defense. It was one of the first four Soviet cities to be awarded the title of "Hero City" in 1945. (These others were Leningrad, Stalingrad, and Sevastopol). Lyudmila Pavlichenko, the famous female sniper, took part in the battle for Odessa. Her first two kills were effected near Belyayevka using a Mosin-Nagant bolt-action rifle with a P.E. 4-power scope. She recorded 187 confirmed kills during the defense of Odessa. Pavlichenko's confirmed kills during World War II totaled 309 (including 36 enemy snipers). Before being occupied by Romanian troops in 1941, a part of the city's population, industry, infrastructure and all cultural valuables possible were evacuated to inner regions of the USSR and the retreating Red Army units destroyed as much as they could of Odessa's remaining harbour facilities. The city was land mined in the same way as Kiev. During World War II, from 1941–1944, Odessa was subject to Romanian administration, as the city had been made part of Transnistria. Partisan fighting continued, however, in the city's catacombs. Following the Siege of Odessa, and the Axis occupation, approximately 25,000 Odessans were murdered in the outskirts of the city and over 35,000 deported; this came to be known as the Odessa massacre. Most of the atrocities were committed during the first six months of the occupation which officially began on 17 October 1941, when 80% of the 210,000 Jews in the region were killed, compared to Jews in Romania proper where the majority survived. After the Nazi forces began to lose ground on the Eastern Front, the Romanian administration changed its policy, refusing to deport the remaining Jewish population to extermination camps in German occupied Poland, and allowing Jews to work as hired labourers. As a result, despite the tragic events of 1941, the survival of the Jewish population in this area was higher than in other areas of occupied eastern Europe. The city suffered severe damage and sustained many casualties over the course of the war. Many parts of Odessa were damaged during both its siege and recapture on 10 April 1944, when the city was finally liberated by the Red Army. Some of the Odessans had a more favourable view of the Romanian occupation, in contrast with the Soviet official view that the period was exclusively a time of hardship, deprivation, oppression and suffering – claims embodied in public monuments and disseminated through the media to this day. Subsequent Soviet policies imprisoned and executed numerous Odessans (and deported most of the German and Tatar population) on account of collaboration with the occupiers. Certificate "For taking part in the heroic defense of Odessa" Logvinov Petr Leontievich was awarded the Medal for the Defense of Odessa. During the 1960s and 1970s, the city grew. Nevertheless, the majority of Odessa's Jews emigrated to Israel, the United States and other Western countries between the 1970s and 1990s. Many ended up in the Brooklyn neighborhood of Brighton Beach, sometimes known as "Little Odessa". Domestic migration of the Odessan middle and upper classes to Moscow and Leningrad, cities that offered even greater opportunities for career advancement, also occurred on a large scale. Despite this, the city grew rapidly by filling the void of those left with new migrants from rural Ukraine and industrial professionals invited from all over the Soviet Union. Nowadays the city is undergoing a phase of widespread urban restoration. As a part of the Ukrainian Soviet Socialist Republic, the city preserved and somewhat reinforced its unique cosmopolitan mix of Russian/Ukrainian/Jewish culture and a predominantly Russophone environment with the uniquely accented dialect of Russian spoken in the city. The city's unique identity has been formed largely thanks to its varied demography; all the city's communities have influenced aspects of Odessan life in some way or form. Odessa is a city of more than 1 million people. The city's industries include shipbuilding, oil refining, chemicals, metalworking, and food processing. Odessa is also a Ukrainian naval base and home to a fishing fleet. It is known for its large outdoor market – the Seventh-Kilometer Market, the largest of its kind in Europe. The city has seen violence in the 2014 pro-Russian conflict in Ukraine during 2014 Odessa clashes. The 2 May 2014 Odessa clashes between pro-Ukrainian and pro-Russian protestors killed 42 people. Four were killed during the protests, and at least 32 trade unionists were killed after a trade union building was set on fire and its exits blocked by Ukrainian nationalists. Polls conducted from September to December 2014 found no support for joining Russia. Odessa was struck by three bomb blasts in December 2014, one of which killed one person (the injuries sustained by the victim indicated that he had dealt with explosives). Internal Affairs Ministry advisor Zorian Shkiryak said on 25 December that Odessa and Kharkiv had become "cities which are being used to escalate tensions" in Ukraine. Shkiryak said that he suspected that these cities were singled out because of their "geographic position". On 5 January 2015 the city's Euromaidan Coordination Center and a cargo train car were (non-lethally) bombed. The Vorontsov Lighthouse in the Gulf of Odessa. The city is located on the Black Sea. Odessa is situated (46°28′N 30°44′E﻿ / ﻿46.467°N 30.733°E﻿ / 46.467; 30.733) on terraced hills overlooking a small harbor on the Black Sea in the Gulf of Odessa, approximately 31 km (19 mi) north of the estuary of the Dniester river and some 443 km (275 mi) south of the Ukrainian capital Kiev. The average elevation at which the city is located is around 50 metres (160 feet), while the maximum is 65 metres (213 feet) and minimum (on the coast) amounts to 4.2 metres (13.8 feet) above sea level. The city currently covers a territory of 163 km2 (63 sq mi), the population density for which is around 6,139 persons/km². Sources of running water in the city include the Dniester River, from which water is taken and then purified at a processing plant just outside the city. Being located in the south of Ukraine, the topography of the area surrounding the city is typically flat and there are no large mountains or hills for many kilometres around. Flora is of the deciduous variety and Odessa is known for its tree-lined avenues which, in the late 19th and early 20th centuries, made the city a favourite year-round retreat for the Russian aristocracy. The city's location on the coast of the Black Sea has also helped to create a booming tourist industry in Odessa. The city's Arkadia beach has long been a favourite place for relaxation, both for the city's inhabitants and its visitors. This is a large sandy beach which is located to the south of the city centre. Odessa's many sandy beaches are considered to be quite unique in Ukraine, as the country's southern coast (particularly in the Crimea) tends to be a location in which the formation of stoney and pebble beaches has proliferated. The coastal cliffs adjacent to the city are home to frequent landslides, resulting in a typical change of landscape along the Black Sea. Due to the fluctuating slopes of land, city planners are responsible for monitoring the stability of such areas, and for preserving potentially threatened building and other structures of the city above sea level near water. Also a potential danger to the infrastructure and architecture of the city is the presence of multiple openings underground. These cavities can cause buildings to collapse, resulting in a loss of money and business. Due to the effects of climate and weather on sedimentary rocks beneath the city, the result is instability under some buildings' foundations. A panoramic view of central Odessa, as seen from the Black Sea. Odessa has a hot-summer humid continental climate (Dfa, using the 0 °C [32 °F] isotherm) that borderlines the semi-arid climate (BSk) as well as a humid subtropical climate (Cfa) This has, over the past few centuries, aided the city greatly in creating conditions necessary for the development of summer tourism. 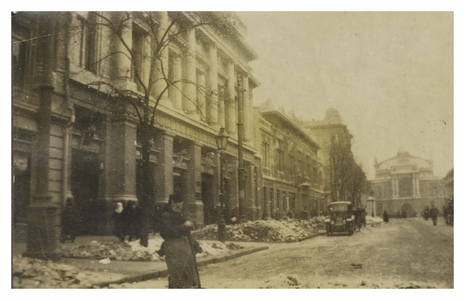 During the tsarist era, Odessa's climate was considered to be beneficial for the body, and thus many wealthy but sickly persons were sent to the city in order to relax and recuperate. This resulted in the development of spa culture and the establishment of a number of high-end hotels in the city. The average annual temperature of sea is 13–14 °C (55–57 °F), whilst seasonal temperatures range from an average of 6 °C (43 °F) in the period from January to March, to 23 °C (73 °F) in August. Typically, for a total of 4 months – from June to September – the average sea temperature in the Gulf of Odessa and city's bay area exceeds 20 °C (68 °F). The city typically experiences dry, cold winters, which are relatively mild when compared to most of Ukraine as they're marked by temperatures which rarely fall below −10 °C (14 °F). Summers on the other hand do see an increased level of precipitation, and the city often experiences warm weather with temperatures often reaching into the high 20s and low 30s. Snow cover is often light or moderate, and municipal services rarely experience the same problems that can often be found in other, more northern, Ukrainian cities. This is largely because the higher winter temperatures and coastal location of Odessa prevent significant snowfall. Additionally the city hardly ever faces the phenomenon of sea-freezing. According to the 2001 census, Ukrainians make up a majority (62 percent) of Odessa's inhabitants, along with an ethnic Russian minority (29 percent). A 2015 study by the International Republican Institute found that 68% of Odessa was ethnic Ukrainian, and 25% ethnic Russian. Despite Odessa's Ukrainian majority, Russian is the dominant language in the city. In 2015, the main language spoken at home was Russian − around 78% of the total population − followed by Ukrainian at 6%, and an equal combination of Ukrainian and Russian, 15%. Odessa oblast is also home to a number of other nationalities and minority ethnic groups, including Albanians, Armenians, Azeris, Crimean Tatars, Bulgarians, Georgians, Greeks, Jews, Poles, Romanians, Turks, among others. Up until the early 1940s the city also had a large Jewish population. As the result of mass deportation to extermination camps during the Second World War, the city's Jewish population declined considerably. Since the 1970s, the majority of the remaining Jewish population emigrated to Israel and other countries, shrinking the Jewish community. Through most of the 19th century and until the mid 20th century, the largest ethnic group in Odessa was Russians, with the second largest ethnic group being the Jews. Whilst Odessa is the administrative centre of the Odessa Oblast, the city is also the main constituent of the Odessa Municipality. However, since Odessa is a city of regional significance, this makes the city subject directly to the administration of the oblast's authorities, thus removing it from the responsibility of the municipality. The city of Odessa is governed by a mayor and city council which work cooperatively to ensure the smooth-running of the city and procure its municipal bylaws. The city's budget is also controlled by the administration. The mayoralty plays the role of the executive in the city's municipal administration. Above all comes the mayor, who is elected, by the city's electorate, for five years in a direct election. 2015 Mayoral election of Odessa Gennadiy Trukhanov was reelected in the first round of the election with 52,9% of the vote. There are five deputy mayors, each of which is responsible for a certain particular part of the city's public policy. 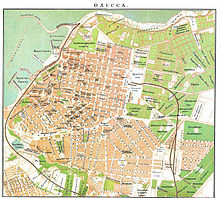 An old map of Odessa's city centre. North is to the left. The City Council of the city makes up the administration's legislative branch, thus effectively making it a city 'parliament' or rada. The municipal council is made up of 120 elected members, who are each elected to represent a certain district of the city for a four-year term. The current council is the fifth in the city's modern history, and was elected in January 2011. In the regular meetings of the municipal council, problems facing the city are discussed, and annually the city's budget is drawn up. The council has seventeen standing commissions which play an important role in controlling the finances and trading practices of the city and its merchants. In addition, every raion has its own administration, subordinate to the Odessa City council, and with limited responsibilities. A panoramic view of Primorsky Boulevard, at the top of the Potemkin Stairs. Many of Odessa's buildings have, rather uniquely for a Ukrainian city, been influenced by the Mediterranean style of classical architecture. This is particularly noticeable in buildings built by architects such as the Italian Francesco Boffo, who in early 19th-century built a palace and colonnade for the Governor of Odessa, Prince Mikhail Vorontsov, the Potocki Palace and many other public buildings. The Italian baroque facade of the Odessa Opera and Ballet Theater. In 1887 one of the city's most well known architectural monuments was completed – the theatre, which still hosts a range of performances to this day; it is widely regarded as one of the world's finest opera houses. The first opera house was opened in 1810 and destroyed by fire in 1873. The modern building was constructed by Fellner and Helmer in neo-baroque; its luxurious hall was built in the rococo style. It is said that thanks to its unique acoustics even a whisper from the stage can be heard in any part of the hall. The theatre was projected along the lines of Dresden's Semperoper built in 1878, with its nontraditional foyer following the curvatures of the auditorium; the building's most recent renovation was completed in 2007. The centre of Odessa, with its statue of Catherine the Great, is one of the city's central landmark. Odessa's most iconic symbol, the Potemkin Steps (Primorsky Stairs) is a vast staircase that conjures an illusion so that those at the top only see a series of large steps, while at the bottom all the steps appear to merge into one pyramid-shaped mass. The original 200 steps (now reduced to 192) were designed by Italian architect Francesco Boffo and built between 1837 and 1841. The steps were made famous by Sergei Eisenstein in his film, The Battleship Potemkin. Most of the city's 19th-century houses were built of limestone mined nearby. Abandoned mines were later used and broadened by local smugglers. This created a gigantic complicated labyrinth of underground tunnels beneath Odessa, known as "Odessa Catacombs". During World War II, the catacombs served as a hiding place for partisans. The Londonskaya Hotel, on Odessa's magnificent Primorsky Bulvar, is one of the city's landmark buildings. Deribasivska Street, an attractive pedestrian avenue named after José de Ribas, the Spanish-born founder of Odessa and decorated Russian Navy Admiral from the Russo-Turkish War, is famous by its unique character and architecture. 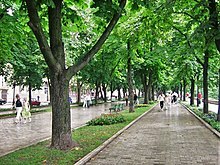 During the summer it is common to find large crowds of people leisurely sitting and talking on the outdoor terraces of numerous cafés, bars and restaurants, or simply enjoying a walk along the cobblestone street, which is not open to vehicular traffic and is kept shaded by the linden trees which line its route. A similar streetscape can also be found in that of Primorsky Bulvar, a grand thoroughfare which runs along the edge of the plateau upon which the city is situated, and where many of the city's most imposing buildings are to be found. As one of the biggest on the Black Sea, Odessa's port is busy all year round. The Odessa Sea Port is located on an artificial stretch of Black Sea coast, along with the north-western part of the Gulf of Odessa. The total shoreline length of Odessa's sea port is around 7.23 kilometres (4.49 mi). The port, which includes an oil refinery, container handling facility, passenger area and numerous areas for handling dry cargo, is lucky in that its work does not depend on seasonal weather; the harbour itself is defended from the elements by breakwaters. The port is able to handle up to 14 million tons of cargo and about 24 million tons of oil products annually, whilst its passenger terminals can cater for around 4 a million passengers a year at full capacity. The city's Preobrazhensky Park surrounds its cathedral. There are a number of public parks and gardens in Odessa, among these are the Preobrazhensky, Gorky and Victory parks, the latter of which is an arboretum. The city is also home to a university botanical garden, which recently celebrated its 200th anniversary, and a number of other smaller gardens. The City Garden, or Gorodskoy Sad, is perhaps the most famous of Odessa's gardens. Laid out in 1803 by Felix De Ribas (brother of the founder of Odessa, José de Ribas) on a plot of urban land he owned, the garden is located right in the heart of the city. When Felix decided that he was no longer able to provide enough money for the garden's upkeep, he decided to present it to the people of Odessa. The transfer of ownership took place on 10 November 1806. Nowadays the garden is home to a bandstand and is the traditional location for outdoor theater in the summertime. Numerous sculptures can also be found within the grounds as well as a musical fountain, the waters of which are computer controlled to coordinate with the musical melody being played. Odessa's largest park, Shevchenko Park (previously Alexander Park), was founded in 1875, during a visit to the city by Emperor Alexander II. The park covers an area of around 700 by 900 metres (2,300 by 3,000 feet) and is located near the centre of the city, on the side closest to the sea. Within the park there are a variety of cultural and entertainment facilities, and wide pedestrian avenues. In the center of the park is the local top-flight football team's Chornomorets Stadium, the Alexander Column and municipal observatory. The Baryatinsky Bulvar is popular for its route, which starts at the park's gate before winding its way along the edge of the coastal plateau. There are a number of monuments and memorials in the park, one of which is dedicated to the park's namesake, the Ukrainian national poet Taras Shevchenko. The Odessa National Scientific Library is a major research library, and centre for study, in southern Ukraine. Odessa is home to several universities and other institutions of higher education. The city's best-known and most prestigious university is the Odessa 'I.I. Mechnikov' National University. This university is the oldest in the city and was first founded by an edict of Tsar Alexander II of Russia in 1865 as the Imperial Novorossiysk University. Since then the university has developed to become one of modern Ukraine's leading research and teaching universities, with staff of around 1,800 and total of thirteen academic faculties. 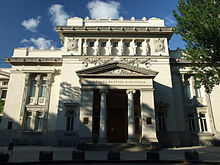 Other than the National University, the city is also home to the 1921-inaugurated Odessa National Economic University, the Odessa National Medical University (founded 1900), the 1918-founded Odessa National Polytechnic University and the Odessa National Maritime University (established 1930). The main building of the Odessa National Medical University. In addition to these universities, the city is home to the Odessa Law Academy, the National Academy of Telecommunications and the Odessa National Maritime Academy. The last of these institutions is a highly specialised and prestigious establishment for the preparation and training of merchant mariners which sees around 1,000 newly qualified officer cadets graduate each year and take up employment in the merchant marines of numerous countries around the world. The South Ukrainian National Pedagogical University is also based in the city, this is one of the largest institutions for the preparation of educational specialists in Ukraine and is recognised as one of the country's finest of such universities. In addition to all the state-run universities mentioned above, Odessa is also home to a large number of private educational institutes and academies which offer highly specified courses in a range of different subjects. These establishments, however, typically charge much higher fees than government-owned establishments and may not have held the same level of official accreditation as their state-run peers. With regard to primary and secondary education, Odessa has a large number of schools catering for all ages from kindergarten through to lyceum (final secondary school level) age. Most of these schools are state-owned and operated, and all schools have to be state-accredited in order to teach children. Odessa Archaeological Museum was designed in the Neoclassical style just like many other landmarks of the city. The Odessa Museum of Western and Eastern Art is arguably Odessa's most important museum; it has large European collections from the 16–20th centuries along with the art from the East on display. There are paintings from Caravaggio, Mignard, Hals, Teniers and Del Piombo. Also of note is the city's Alexander Pushkin Museum, which is dedicated to detailing the short time Pushkin spent in exile in Odessa, a period during which he continued to write. The poet also has a city street named after him, as well as a statue. Other museums in the city include the Odessa Archeological Museum, which is housed in a neoclassical building, the Odessa Numismatics Museum, the Odessa Art Museum, the Odessa Museum of the Regional History, Museum of Heroic Defense of Odessa (411th Battery). Among the city's public sculptures, two sets of Medici lions can be noted, at the Vorontsov Palace as well as the Starosinnyi Garden. Jacob Adler, the major star of the Yiddish theatre in New York and father of the actor, director and teacher Stella Adler, was born and spent his youth in Odessa. The most popular Russian show business people from Odessa are Yakov Smirnoff (comedian), Mikhail Zhvanetsky (legendary humorist writer, who began his career as a port engineer) and Roman Kartsev (comedian Карцев, Роман Андреевич [ru]). Zhvanetsky's and Kartsev's success in the 1970s, along with Odessa's KVN team, contributed to Odessa's established status as "capital of Soviet humor", culminating in the annual Humoryna festival, carried out around the beginning of April. Odessa was also the home of the late Armenian painter Sarkis Ordyan (1918–2003), the Ukrainian painter Mickola Vorokhta and the Greek philologist, author and promoter of Demotic Greek Ioannis Psycharis (1854–1929). Yuri Siritsov, bass player of the Israeli Metal band PallaneX is originally from Odessa. Igor Glazer Production Manager Baruch Agadati (1895–1976), the Israeli classical ballet dancer, choreographer, painter, and film producer and director grew up in Odessa, as did Israeli artist and author Nachum Gutman (1898–1980). Israeli painter Avigdor Stematsky (1908–89) was born in Odessa. The main hall of the Odessa Philharmonic Society's theatre. 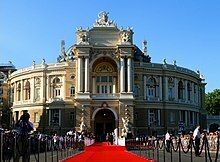 The Odessa International Film Festival is also held in this city annually since 2010. The School of Stolyarsky, founded in 1933, has long been recognised as a centre of musical excellence. Poet Anna Akhmatova was born in Bolshoy Fontan near Odessa. The city has produced many writers, including Isaac Babel, whose series of short stories, Odessa Tales, are set in the city. Other Odessites are the duo Ilf and Petrov, and Yuri Olesha. Vera Inber, a poet and writer, as well as the poet and journalist, Margarita Aliger were both born in Odessa. The Italian writer, slavist and anti-fascist dissident Leone Ginzburg was born in Odessa into a Jewish family, and then went to Italy where he grew up and lived. One of the most prominent pre-war Soviet writers, Valentin Kataev, was born here and began his writing career as early as high school (gymnasia). Before moving to Moscow in 1922, he made quite a few acquaintances here, including Yury Olesha and Ilya Ilf (Ilf's co-author Petrov was in fact Kataev's brother, Petrov being his pen-name). Kataev became a benefactor for these young authors, who would become some of the most talented and popular Russian writers of this period. In 1955 Kataev became the first chief editor of the Youth (Russian: Юность, Yunost'), one of the leading literature magazines of the Ottepel of the 1950s and 1960s. These authors and comedians played a great role in establishing the "Odessa myth" in the Soviet Union. Odessites were and are viewed in the ethnic stereotype as sharp-witted, street-wise and eternally optimistic. These qualities are reflected in the "Odessa dialect", which borrows chiefly from the characteristic speech of the Odessan Jews, and is enriched by a plethora of influences common for the port city. The "Odessite speech" became a staple of the "Soviet Jew" depicted in a multitude of jokes and comedy acts, in which a Jewish adherent served as a wise and subtle dissenter and opportunist, always pursuing his own well-being, but unwittingly pointing out the flaws and absurdities of the Soviet regime. The Odessan Jew in the jokes always "came out clean" and was, in the end, a lovable character – unlike some of other jocular nation stereotypes such as The Chukcha, The Ukrainian, The Estonian or The American. Odessa is a popular tourist destination, with many therapeutic resorts in and around the city. The city's Filatov Institute of Eye Diseases & Tissue Therapy is one of the world's leading ophthalmology clinics. April Fools' Day, held annually on 1 April, is one of the most celebrated festivals in the city. Practical joking is a central theme throughout, and Odessans dress in unique, colorful attire to express their spontaneous and comedic selves. The tradition has been celebrated since the early 1970s, when the humor of Ukraine’s citizens were drawn to television and the media, further developing into a mass festival. Large amounts of money are made from the festivities, supporting Odessa’s local entertainers and shops. Pyotr Schmidt (better known as "Lieutenant Schmidt"), one of the leaders of the Sevastopol uprising, was born in Odessa. Ze'ev Jabotinsky was born in Odessa, and largely developed his version of Zionism there in the early 1920s. One Marshal of the Soviet Union, Rodion Yakovlevich Malinovsky, a military commander in World War II and Defense Minister of the Soviet Union, was born in Odessa, whilst renowned Nazi hunter Simon Wiesenthal lived in the city at one time. Georgi Rosenblum, who was employed by William Melville as one of the first spies of the British Secret Service Bureau, was a native Odessan. Another intelligence agent from Odessa was Genrikh Lyushkov, who joined in the Odessa Cheka in 1920 and reached two-star rank in the NKVD before fleeing to Japanese-occupied Manchuria in 1938 to avoid being murdered. The composer Jacob Weinberg (1879–1956) was born in Odessa. He composed over 135 works and was the founder of the Jewish National Conservatory in Jerusalem before immigrating to the U.S. where he became "an influential voice in the promotion of American Jewish music". Valeria Lukyanova, a girl from Odessa who looks very similar to a Barbie doll, has received attention on the Internet and from the media for her doll-like appearance. Mikhail Zhvanetsky, writer, satirist and performer best known for his shows targeting different aspects of the Soviet and post-Soviet everyday life is one of most famous living Odessans. Kostyantyn Mykolayovych Bocharov, better known by his stage name, Mélovin, is a native of Odessa. He is best known for winning season six of X-Factor Ukraine and for representing Ukraine in the Eurovision Song Contest 2018, singing the song "Under the Ladder". Odessa's port is Ukraine's busiest. The harbour remains accessible all year round and serves as a vital import/export channel for the Ukrainian economy. The economy of Odessa largely stems from its traditional role as a port city. The nearly ice-free port lies near the mouths of the Dnieper, the Southern Bug, the Dniester and the Danube rivers, which provide good links to the hinterland. During the Soviet period (until 1991) the city functioned as the USSR's largest trading port; it continues in a similar role as independent Ukraine's busiest international port. The port complex contains an oil and gas transfer and storage facility, a cargo-handling area and a large passenger port. In 2007 the Port of Odessa handled 31,368,000 tonnes of cargo. The port of Odessa is also one of the Ukrainian Navy's most important bases on the Black Sea. Rail transport is another important sector of the economy in Odessa – largely due to the role it plays in delivering goods and imports to and from the city's port. At present, 5% of the industrial production of Ukraine takes place in the Odessa region. Industrial enterprises located in and around the city include those dedicated to fuel refinement, machine building, metallurgy, and other types of light industry such as food preparation, timber plants and chemical industry. Agriculture is a relatively important sector in the territories surrounding the city. The Seventh-Kilometer Market is a major commercial complex on the outskirts of the city where private traders now operate one of the largest market complexes in Eastern Europe. The market has roughly 6,000 traders and an estimated 150,000 customers per day. Daily sales, according to the Ukrainian periodical Zerkalo Nedeli, were believed to be as high as USD 20 million in 2004. With a staff of 1,200 (mostly guards and janitors), the market is also the region's largest employer. It is owned by local land and agriculture tycoon Viktor A. Dobriansky and three partners of his. Tavria-V is the most popular retail chain in Odessa. Key areas of business include: retail, wholesale, catering, production, construction and development, private label. Consumer recognition is mainly attributed[by whom?] to the high level of service and the quality of services. Tavria-V is the biggest private company and the biggest tax payer. The Passage galleries, one of the city's landmarks. Deribasivska Street is one of the city's most important commercial streets, hosting a large number of the city's boutiques and higher-end shops. In addition to this there are a number of large commercial shopping centres in the city. The 19th-century shopping gallery Passage was, for a long time, the city's most upscale shopping district, and remains to this day[update] an important landmark of Odessa. The tourism sector is of great importance to Odessa, which is currently[when?] the second most-visited Ukrainian city. In 2003 this sector recorded a total revenue of 189,2 mln UAH. Other sectors of the city's economy include the banking sector: the city hosts a branch of the National Bank of Ukraine. Imexbank, one of Ukraine's largest commercial banks, is based in the city. Foreign business ventures have thrived in the area, as since 1 January 2000, much of the city and its surrounding area has been declared[by whom?] a free economic zone – this has aided the foundation of foreign companies' and corporations' Ukrainian divisions and allowed them to more easily invest in the Ukrainian manufacturing and service sectors. To date a number of Japanese and Chinese companies, as well as a host of European enterprises, have invested in the development of the free economic zone, to this end private investors in the city have invested a great deal of money into the provision of quality office real estate and modern manufacturing facilities such as warehouses and plant complexes. A number of world-famous scientists have lived and worked in Odessa. They include: Illya Mechnikov (Nobel Prize in Medicine 1908), Igor Tamm (Nobel Prize in Physics 1958), Selman Waksman (Nobel Prize in Medicine 1952), Dmitri Mendeleev, Nikolay Pirogov, Ivan Sechenov, Vladimir Filatov, Nikolay Umov, Leonid Mandelstam, Aleksandr Lyapunov, Mark Krein, Alexander Smakula, Waldemar Haffkine, Valentin Glushko, and George Gamow. Odessa has long been an important Black Sea port. Odessa is a major maritime-transport hub that includes several ports including Port of Odessa, Port of Chornomorsk (ferry, freight), Yuzhne (freight only). The Port of Odessa became a provisional headquarters for the Ukrainian Navy, following the Russian occupation of Crimea in 2014. 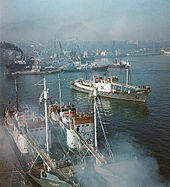 Before the fall of the Soviet Union, the Port of Odessa harbored the major Soviet cruise line Black Sea Shipping Company. Passenger ships and ferries connect Odessa with Istanbul, Haifa and Varna, whilst river cruises can occasionally be booked for travel up the Dnieper River to cities such as Kherson, Dnipro and Kiev. The first car in Russian Empire, a Mercedes-Benz belonging to V. Navrotsky, came to Odessa from France in 1891. He was a popular city publisher of the newspaper The Odessa Leaf. The M05 Highway links Odessa with the nation's capital, Kiev. Odessa junction. Odessa is linked to the Ukrainian capital, Kiev, by the M05 Highway, a high quality multi-lane road which is set to be re-designated, after further reconstructive works, as an 'Avtomagistral' (motorway) in the near future. Other routes of national significance, passing through Odessa, include the M16 Highway to Moldova, M15 to Izmail and Romania, and the M14 which runs from Odessa, through Mykolaiv and Kherson to Ukraine's eastern border with Russia. The M14 is of particular importance to Odessa's maritime and shipbuilding industries as it links the city with Ukraine's other large deep water port Mariupol which is located in the south east of the country. Odessa also has a well-developed system of inter-urban municipal roads and minor beltways. However, the city is still lacking an extra-urban bypass for transit traffic which does not wish to proceed through the city centre. Intercity bus services are available from Odessa to many cities in Russia (Moscow, Rostov-on-Don, Krasnodar, Pyatigorsk), Germany (Berlin, Hamburg and Munich), Greece (Thessaloniki and Athens), Bulgaria (Varna and Sofia) and several cities of Ukraine and Europe. 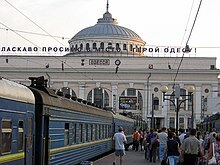 Odesa Holovna is one of Ukraine's largest railway terminals. Every day trains depart to a large number of national and international destinations. Odessa is served by a number of railway stations and halts, the largest of which is Odesa Holovna (Main Station), from where passenger train services connect Odessa with Warsaw, Prague, Bratislava, Vienna, Berlin, Moscow, St. Petersburg, the cities of Ukraine and many other cities of the former USSR. The city's first railway station was opened in the 1880s, however, during the Second World War, the iconic building of the main station, which had long been considered to be one of the Russian Empire's premier stations, was destroyed through enemy action. In 1952 the station was rebuilt to the designs of A Chuprina. The current station, which is characterised by its many socialist-realist architectural details and grand scale, was renovated by the state railway operator Ukrainian Railways in 2006. An Odessa tram on Sofievska Street. In 1881 Odessa became the first city in Imperial Russia to have steam tramway lines, an innovation that came only one year after the establishment of horse tramway services in 1880 operated by the "Tramways d'Odessa", a Belgian owned company. The first metre gauge steam tramway line ran from Railway Station to Great Fontaine and the second one to Hadzhi Bey Liman. These routes were both operated by the same Belgian company. Electric tramway started to operate on 22 August 1907. Trams were imported from Germany. The city's public transit system is currently made up of trams, trolleybuses, buses and fixed-route taxis (marshrutkas). Odessa also has a cable car to Vidrada Beach, and recreational ferry service. One additional mode of transport in Odessa is quite unique; the Potemkin Stairs funicular railway, which runs between the city's Primorsky Bulvar and the sea terminal, has been in service since 1902. In 1998, after many years of neglect, the city decided to raise funds for a replacement track and cars. This project was delayed on multiple occasions but was finally completed eight years later in 2005. The funicular has now become as much a part of historic Odessa as the staircase to which it runs parallel. Odessa International Airport, which is located to the south-west of the city centre, is served by a number of airlines. The airport is also often used by citizens of neighbouring countries for whom Odessa is the nearest large city and who can travel visa-free to Ukraine. Transit flights from the Americas, Africa, Asia, Europe and the Middle East to Odessa are offered by Ukraine International Airlines through their hub at Kiev's Boryspil International Airport. Additionally Turkish Airlines wide network and daily flights offers more than 246 destinations all over the world. The most popular sport in Odessa is football. The main professional football club in the city is FC Chornomorets Odesa, who play in the Ukrainian Premier League. Chornomorets play their home games at the Chornomorets Stadium, an elite-class stadium which has a maximum capacity of 34,164. The second football team in Odessa is FC Odessa. Basketball is also a prominent sport in Odessa, with BC Odessa representing the city in the Ukrainian Basketball League, the highest tier basketball league in Ukraine. Odessa will become one of five Ukrainian cities to host the 39th European Basketball Championship in 2015. Chess player Efim Geller was born in the city. Gymnast Tatiana Gutsu (known as "The Painted Bird of Odessa") brought home Ukraine's first Olympic gold medal as an independent nation when she outscored the USA's Shannon Miller in the women's all-around event at 1992 Summer Olympics in Barcelona, Spain. Figure skaters Oksana Grishuk and Evgeny Platov won the 1994 and 1998 Olympic gold medals as well as the 1994, 1995, 1996, and 1997 World Championships in ice dance. Both were born and raised in the city, though they skated at first for the Soviet Union, in the Unified Team, the Commonwealth of Independent States, and then Russia. Hennadiy Avdyeyenko won a 1988 Olympic gold medal in thehigh jump, setting an Olympic record at 2.38 metres (7.81 feet). ^ a b "Incumbent Odesa Mayor Trukhanov declared winner in Sunday mayoral election". interfax.com.ua. ^ "Who's Behind A String Of Bombings In Ukraine's Black Sea 'Pearl'?". NPR. 2015. Retrieved 7 July 2016. ^ Herlihy, Patricia (1977). "The Ethnic Composition of the City of Odessa in the Nineteenth Century" (PDF). Harvard Ukrainian Studies. 1 (1): 53–78. Archived from the original (PDF) on 29 May 2008. ^ a b "Odessa: Architecture and Monuments". UKRWorld.Com. 2009. Archived from the original on 6 March 2012. Retrieved 9 June 2009. ^ Isaac, Benjamin H. (1 January 1986). "The Greek Settlements in Thrace Until the Macedonian Conquest". BRILL – via Google Books. ^ Kalinin, Igor. "Одесские достопримечательности — раскопки греческого поселения". odessaguide.net. ^ "The Greek Colonisation of the Black Sea Area: Historical Interpretation of Archaeology," December 1998, Tsetskhladze, Gocha R. (ed. ), Franz Steiner Verlag, p. 41, n. 116. ^ a b Richardson, p. 110. ^ Clive Pointing, The Crimean War: The Truth Behind the Myth, Chatto & Windus, London, 2004, ISBN 0-7011-7390-4. ^ "The Jewish Community of Odessa". The Museum of the Jewish People at Beit Hatfutsot. ^ a b Richardson, p. 33. ^ "The Antonescu Paradox". Foreign Policy. 5 February 2016. ^ Canada (2 May 2014). "At least 35 killed in Odessa, Ukraine, as building set on fire". The Globe and Mail. Archived from the original on 6 May 2014. Retrieved 22 May 2014. ^ "Лише 3% українців хочуть приєднання їх області до Росії" [Only 3% of Ukrainians want their region to become part of Russia]. Dzerkalo Tyzhnia (in Ukrainian). 3 January 2015. ^ Cherkez, E. A.; Dragomyretska, O. V.; Gorokhovich, Y. (11 November 2006). "Landslide protection of the historical heritage in Odessa (Ukraine)". Landslides. 3 (4): 303–309. doi:10.1007/s10346-006-0058-8. ^ "Odessa Climate Guide". Retrieved 5 June 2009. ^ Погода и Климат – Климат Одессы [Weather and Climate – The Climate of Odessa] (in Russian). Weather and Climate (Погода и климат). Retrieved 23 May 2013. ^ "Odessa Climate Normals 1961–1990". National Oceanic and Atmospheric Administration. Retrieved 10 September 2015. ^ a b "All-Ukrainian Census of 2001 Official Site". 2001.ukrcensus.gov.ua. Retrieved 22 May 2014. ^ a b "Ukrainian Municipal Survey, March 2–20, 2015" (PDF). IRI. ^ "Демоскоп Weekly – Приложение. Справочник статистических показателей". demoscope.ru. ^ "Данные Всесоюзной переписи населения 1926 года по регионам республик СССР". Demoscope.ru. Retrieved 22 May 2014. ^ "Всесоюзная перепись населения 1939 года. Нац��ональный состав населения районов, городов и крупных сел союзных республик СССР". Demoscope.ru. Retrieved 15 April 2015. ^ "Всеукраїнський перепис населення 2001 - English version - Results - General results of the census - National composition of population - Odesa region:". ukrcensus.gov.ua. ^ "Official Website of the city administration: Structure of the Mayorality". Odessa.ua. 1 April 2008. Retrieved 28 October 2011. ^ "Official Website of the city administration: City Council". Odessa.ua. 14 July 2011. Retrieved 28 October 2011. ^ "City Council members". Odessa.ua. 1 April 2008. Retrieved 28 October 2011. ^ "Official Website of the city administration, Standing commissions of the City Council". Odessa.ua. 1 April 2008. Retrieved 28 October 2011. ^ "Deribasovskaya Street". Archived from the original on 4 January 2012. Retrieved 26 December 2011. ^ "The Passage". Archived from the original on 4 January 2012. Retrieved 26 December 2011. ^ "Odessa: The Star of Exile". jpost.com. ^ Anderson, Nancy K.; Anna Andreevna Akhmatova (2004). The word that causes death's defeat. Yale University Press. ISBN 0-300-10377-8. ^ Tanny, Jarrod (2011). City of Rogues and Schnorrers: Russia's Jews and the Myth of Old Odessa. Bloomington: Indiana University Press. pp. 13–22, 142–156. ISBN 978-0-253-22328-9. Retrieved 12 February 2016. ^ Barry, Ellen (1 April 2013). "Odessa Celebrates April Fools' Day". The New York Times. ISSN 0362-4331. Retrieved 14 November 2016. ^ Nissani, Noah (1996). "Ze'ev Jabotinsky – Brief Biography". Liberal.Org. Archived from the original on 20 June 2009. Retrieved 9 June 2009. ^ von Rhein, John (19 August 2005). "Jacob Weinberg: Piano Concerto No. 2 in C Major". Chicago Tribune. Retrieved 29 August 2014. ^ Soldak, Katya (17 October 2012). "Barbie Flu Spreading in Ukraine". Forbes. ^ Jackson, Kate. "Bizarre obsessions of real-life Barbie". The Sun. London. Retrieved 12 February 2016. ^ Whitelocks, Sadie (1 February 2013). "Our childhood dreams shattered". Daily Mail. London. ^ Kravtsiv, Bohdan (2012). "Odesa". Internet Encyclopedia of Ukraine. Canadian Institute of Ukrainian Studies. Retrieved 4 November 2014. Odesa is situated on a large, virtually ice-free bay on the Black Sea, near the mouths of the Danube River, the Dnister River, the Boh River, and the Dnieper River, which link it with the interior of the country. ^ "Economics of Odessa - A Simple Primer". ILoveOdessa.eu. Retrieved 15 February 2018. ^ "Одесса | о городе". Odessa-info.com.ua. Archived from the original on 24 May 2013. Retrieved 12 March 2013. ^ Schmalstieg, Frank C; Goldman Armond S (May 2008). "Ilya Ilich Metchnikoff (1845–1915) and Paul Ehrlich (1854–1915): the centennial of the 1908 Nobel Prize in Physiology or Medicine". Journal of Medical Biography. England. 16 (2): 96–103. doi:10.1258/jmb.2008.008006. PMID 18463079. ^ "Odessa Tram Themes". Retrieved 2 May 2006. ^ "Sister Cities of Istanbul". Retrieved 2 November 2008. ^ "Sister Cities". Baltimore Convention & Tourism Board. Archived from the original on 11 October 2011. Retrieved 19 October 2011. ^ "Twin City activities". Haifa Municipality. Archived from the original on 21 June 2008. Retrieved 2 November 2008. ^ "Liverpool City Council: twinning". Archived from the original on 6 July 2010. Retrieved 2 November 2008. ^ "Marseille Official Website – Twin Cities" (in French). 2008 Ville de Marseille. Archived from the original on 5 May 2008. Retrieved 26 November 2008. ^ "Ystävyyskaupungit (Twin Cities)". Oulun kaupunki (City of Oulu) (in Finnish). Retrieved 27 July 2013. ^ "Vancouver Twinning Relationships" (PDF). City of Vancouver. Retrieved 18 July 2009. ^ "Sister Cities". yerevan.am. Retrieved 18 April 2018. ^ Побратимские связи г. Бреста (in Russian). City.brest.by. Archived from the original on 18 April 2009. Retrieved 3 October 2010. ^ "Gdańsk Official Website: 'Miasta partnerskie'" (in Polish and English). Gdansk.pl. 2009. Archived from the original on 23 July 2013. Retrieved 11 July 2009. Richardson, Tanya (2008). Kaleidoscopic Odessa: History and Place in Contemporary Ukraine. University of Toronto Press. ISBN 0-8020-9563-1. Retrieved 7 November 2009. Dallin, Alexander (1998). Odessa, 1941–1944: A Case Study of Soviet Territory Under Foreign Rule. Iaşi: Center for Romanian Studies. ISBN 973-98391-1-8. Archived from the original on 5 February 2012. Retrieved 7 November 2009. Complete book available online. Ghervas, Stella (2008). "Odessa et les confins de l'Europe: un éclairage historique". In Ghervas, Stella; Rosset, François (eds.). Lieux d'Europe. Mythes et limites. Paris: Editions de la Maison des sciences de l'homme. ISBN 978-2-7351-1182-4. Ghervas, Stella (2008). Réinventer la tradition. Alexandre Stourdza et l'Europe de la Sainte-Alliance. Paris: Honoré Champion. ISBN 978-2-7453-1669-1. Gubar, Oleg (2004). Odessa: New Monuments, Memorial Plaques, and Buildings. Odessa: Optimum. ISBN 966-8072-86-3. Herlihy, Patricia (1979–1980). "Greek Merchants in Odessa in the Nineteenth Century" (PDF). Harvard Ukrainian Studies. pp. 399–420. Archived from the original (PDF) on 29 May 2008. Herlihy, Patricia (2002). "Commerce and Architecture in Odessa in Late Imperial Russia". Commerce in Russian Urban Culture 1861–1914. Baltimore: Johns Hopkins University Press. ISBN 0-8018-6750-9. Herlihy, Patricia (2003). "Port Jews of Odessa and Trieste: A Tale of Two Cities". Jahrbuch des Simon-Dubnow-Instituts. München: Deutsche Verlags-Anstalt. 2: 182–198. ISBN 3-421-05522-X. Herlihy, Patricia; Gubar, Oleg (2008). "The Persuasive Power of the Odessa Myth". In Czaplicka, John; Gelazis, Nida; Ruble, Blair A. (eds.). Cities after the Fall of Communism: Reshaping Cultural Landscapes and European Identity. Woodrow Wilson Center Press and Johns Hopkins University Press. ISBN 978-0-8018-9191-5. King, Charles (2011). Odessa: Genius and Death in a City of Dreams. W. W. Norton & Company. ISBN 978-0-393-07084-2. Kononova, G. (1984). Odessa: A Guide. Moscow: Raduga Publishers. OCLC 12344892. Makolkin, Anna (2004). A History of Odessa, the Last Italian Black Sea Colony. Lewiston, NY: Edwin Mellen Press. ISBN 0-7734-6272-4. Mazis, John Athanasios (2004). The Greeks of Odessa: Diaspora Leadership in Late Imperial Russia. East European Monographs. New York: Columbia University Press. ISBN 0-88033-545-9. Orbach, Alexander (1997). New Voices of Russian Jewry: A Study of the Russian-Jewish Press of Odessa in the Era of the Great Reforms, 1860–1871. Studies in Judaism in Modern Times, No. 4. Leiden: Brill Academic Publishers. ISBN 90-04-06175-4. Rothstein, Robert A. (2001). "How It Was Sung in Odessa: At the Intersection of Russian and Yiddish Folk Culture". Slavic Review. 60 (4): 781–801. doi:10.2307/2697495. JSTOR 2697495. Skinner, Frederick W. (1986). "Odessa and the Problem of Urban Modernization". The City in Late Imperial Russia. Indiana–Michigan Series in Russian and East European Studies. Bloomington, Indiana: Indiana University Press. ISBN 0-253-31370-8. Sylvester, Roshanna P. (2001). "City of Thieves: Moldavanka, Criminality, and Respectability in Prerevolutionary Odessa". Journal of Urban History. 27 (2): 131–157. doi:10.1177/009614420102700201. PMID 18333319. Weinberg, Robert (1992). "The Pogrom of 1905 in Odessa: A Case Study". Pogroms: Anti-Jewish Violence in Modern Russian History. Cambridge: Cambridge University Press. ISBN 0-521-40532-7. Weinberg, Robert (1993). The Revolution of 1905 in Odessa: Blood on the Steps. Indiana–Michigan Series in Russian and East European Studies. Bloomington, IN: Indiana University Press. ISBN 0-253-36381-0. Herlihy, Patricia (1994). "Review of The Revolution of 1905 in Odessa: Blood on the Steps by Robert Weinberg". Journal of Social History. 28 (2): 435–437. doi:10.1353/jsh/28.2.435. JSTOR 3788930. Walker, Shaun (13 July 2013). "Marriage, Ukrainian-style: Hopeful bachelors from all over the world head to Odessa in search of a wife". The Independent. London. The murder of the Jews of Odessa during World War II, at Yad Vashem website.